I always like to tell people that I approach wellness first and foremost as a conversation: a constant dialogue with myself and others that allows me to evolve and learn in a truly holistic way on a moment-to-moment basis. 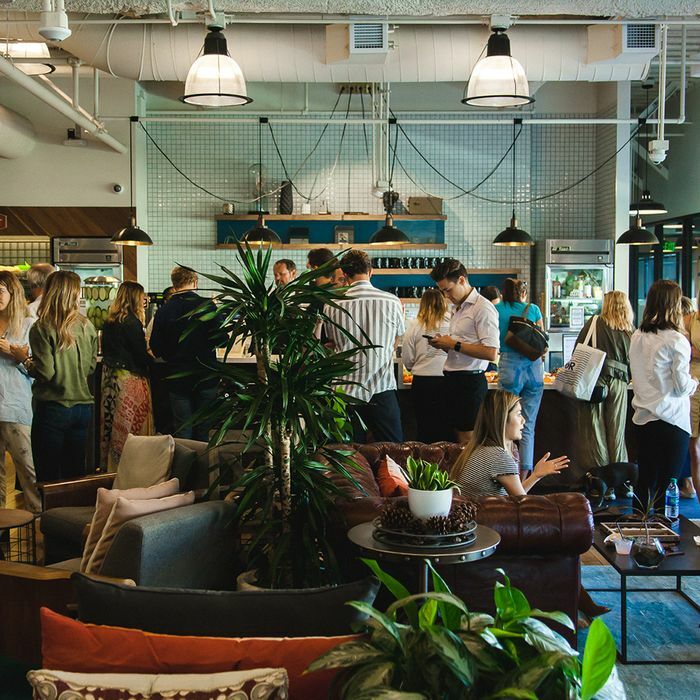 Plus, I just love talking about it—which is why I was thrilled to be invited by WeWork and Runway Playa Vista to host a panel about wellness with four leading experts in the industry. 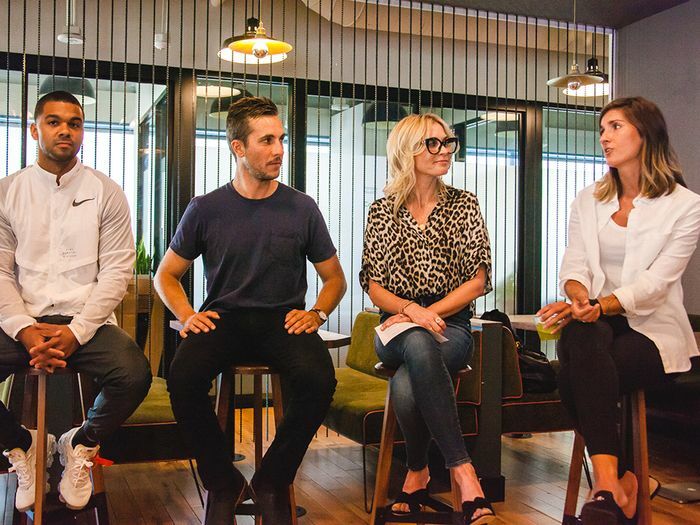 Celebrity trainer Chase Weber, Dave Harper of Aussie hot spot Bondi Harvest, Helen McKeon of Lululemon, and Lisa Hirsch-Solomon, the founder and owner of The Studio (MDR), joined me for a dynamic exchange about our ever-evolving definition of health and how we can all learn to take care of ourselves a little more every day. Needless to say, WeWork served as the perfect setting for a conversation about incorporating wellness into our daily routines. The company's mission is to create a shared workspace that feels more like a community, allowing members to create and collaborate in a relaxed environment—which, as we know, is the foundation for feeling happy and healthy throughout the day. That's not to mention that neighboring Runway Playa Vista is packed with wellness offerings including The Studio (MDR), Whole Foods, and a Lululemon pop-up. So after passing CBD-infused cocktails and dipping into a stunning charcuterie table, we kicked the panel off—and found our conversation spanning topics from the importance of advocating for mental health to whether the power of ritual might be overrated. Find some of our favorite takeaways below. 1. Rituals are great, but don't forget to change things up. 2. If you haven't tried CBD, it might be worth giving it a shot. The topic of CBD came up a few times during our conversation, likely because it's a very buzzy ingredient in the L.A. wellness scene right now. But even if you're a little wary of giving a cannabis compound a try, keep in mind that CBD doesn't have any psychoactive effects and has a lot of compelling science to back it up. Studies show that CBD can significantly reduce symptoms of anxiety. 3. Streaming workouts are a great way to get access to the buzziest classes. Those of us who live in New York in L.A. are spoiled by the fact that exciting boutique studios are popping up all the time. But the good news is that more and more of these fitness hubs are launching streaming workouts—consider the cult-fave rebounding workout Lekfit or even YogaGlo, which offer access to video classes by some of the top instructors in the world. You can bring some of the buzziest workouts into your own living room at an affordable price—and trend seems to indicate that this landscape is only going to get better. 4. On the flip side, don't be afraid to go back to basics. Harper noted the surge of outdoor workout meetups—a chance to spend time outside, get moving, and interact with your community IRL (a nice antidote to social media). Plus, heading outside with your friends is free! If you're looking for other ways to shake up your routine, McKeon also noted that it's worth checking in with local studios and businesses to see if they offer any programming or activations—or venturing to a new locale altogether. For example, the Lululemon pop-up at Runway offers yoga classes, and Yogaworks and The Studio (MDR) are also popular haunts. 5. Don't underestimate the power of a bedtime routine. Every expert endorsed this twofold piece of advice: Prioritize sleep, and to make that shut-eye as high-quality as possible, really take the time to unwind before bed. McKeon noted that she tries to set aside two hours to light some candles or incense, tidy her bedroom, and slide into bed with a book. That also means stepping away from your inbox and, ideally, powering off all your devices so you can give your brain a chance to wind down from constant stimulation. 6. Practicing kindness to others is a form of self-care. When we steered the conversation toward mental health, all our experts agreed that it's so important just to talk about it—and always take the time to check in with people, whether it seems like they're struggling or not. Hirsch-Solomon noted that at her studio, she and her staff always make sure to create an environment that feels like a haven from any problems or stresses a customer might be facing in their daily lives. Paying it forward—even in very simple ways—can make all the difference in someone's day and mood, and it has the double benefit of making us feel better, too.